It’s the term kids love and parents sometimes dread. After the initial excitement wears off, a chorus of “I’m bored!” begins to echo throughout the house. If it’s too frigid outside to make a real snowman, settle for five miniature ones using this activity from Paige’s Party Ideas. Use white paint to make a handprint on some colored paper, then use markers or paint for the snowmen’s faces and accessories. Paint the Snow — Inside! Stay warm and play in the snow at the same time with this simple activity from My Life and Kids. Fill a large plastic tub with snow and bring it inside. Use colored water and paintbrushes or a spray bottle to add a bit of color, and use kitchen utensils or sandbox toys to scoop, bury and build. This idea from Parenting Chaos offers versatile fun for a wide range of ages. As an added bonus, it can be done with materials you likely already have around the house! Help your kids find their inner architect – and have a yummy snack, too, with this idea from Simply Designing. From a simple house to a complicated suspension bridge, the feats of engineering are endless. Toddlers and preschoolers will burn off energy and get a leg up in learning the alphabet with this easy DIY activity from Busy Toddler. Add the element of surprise by taping the letters around the house before the kids wake up. Work on fine motor skills and letter recognition with this simple toddler activity from Busy Toddler. All you need are dot stickers, construction paper, and a marker. 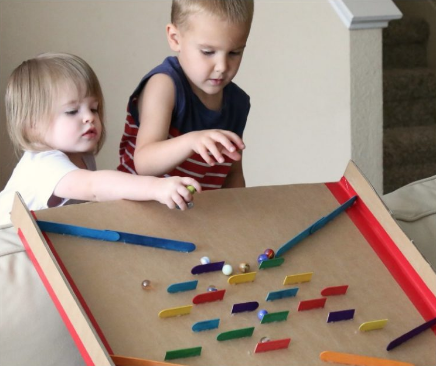 Use cardboard, craft sticks and hot glue to create an epic marble run with this idea from Frugal Fun for Boys and Girls. Kids of all ages will love it — just make sure little ones keep the marbles away from their mouths, or make the run a larger scale and use bigger balls. Turn snack time up a notch by making these winter-iffic snowman s’mores with a nice, hot mug of cocoa. The Shabby Creek Cottage shares how to make these fun, tasty treats. Take advantage of all that fresh snow outside to create a cool science experiment, courtesy of Growing a Jeweled Rose. Let your kids help build the volcano and choose the lava color to give them more ownership in this fun activity. Frugal Fun for Boys and Girls saves the day again with this inventive idea. Allow your little ones to enjoy their favorite arcade game with a few laundry baskets, some ball pit balls, and a cardboard box-turned-ramp. For more snow day activities, check out Northeast Ohio Parent’s “Snow Day Crafts & Activities” board on Pinterest.